University of Maine football players stretch during practice in Orono on Monday. It won’t take long for the University of Maine’s football team to find out where it stands in the Colonial Athletic Association. Third-year head coach Joe Harasymiak’s Black Bears will know late Thursday night. That’s because UMaine opens at home Thursday night against the University of New Hampshire, which has made 14 consecutive Football Championship Subdivision playoff appearances and is ranked third in one preseason poll and ninth in another. The Black Bears, 4-6 overall and 3-5 in the CAA last year including two one-point losses, will find out how well they can move the ball with an inexperienced offensive line and without All-American running back Josh Mack, who transferred to Football Bowl Subdivision team Liberty University in Virginia. They will also discover if their veteran defensive unit can become one of the CAA’s best after being a respectable middle-of-the-pack unit in most categories a year ago. The defense should keep the Black Bears in games while the offense develops. Chris Ferguson had a solid first season quarterbacking the Black Bears as a redshirt freshman. He was fourth in the CAA in passing yards per game (206.4) and tossed 16 touchdown passes while being intercepted 11 times. He completed 54.6 percent of his passes. But he threw just one TD pass in the fourth quarter and was picked off four times as the Black Bears were outscored 58-13 in the final period of their six losses. Ferguson should be now ready to take his game to the next level and be more consistent, especially in the fourth quarter. But he may not have as much time to make decisions while the line develops so he will have to become more maneuverable in the pocket. If he is able to scramble for the occasional first down, it would be a big boost to the offense. His receiver corps has both quality and experience in senior Micah Wright and juniors Jaquan Blair and speedster Earnest Edwards. Game-changer Wright was UMaine’s leading receiver in 2016 (44 catches-688 yards, 7 TDs) and 2015 (61-818, 5 TDs), but a suspension and a season-ending knee injury limited him to just five games a year ago (13-150, 2 TDs). Blair is the team’s top returning pass-catcher (23-242). Edwards caught 21 passes and led the team in yards per catch at 17.7. Redshirt freshman Devin Young and Old Town sophomore Andre Miller will also get reps at wide receiver. Converted quarterback Drew Belcher was a pleasant surprise a year ago as the tight end-H back, hauling in 17 passes for 233 yards, and he could be a valuable weapon. “He was thrown into the fire last year and had to learn things on the fly. I expect to see a nice progression this year,” Harasymiak said. Harasymiak is “very confident” UMaine will have a productive running game. Hard-running North Yarmouth redshirt junior Joe Fitzpatrick, the team’s second-leading rusher a year ago with 382 yards on 64 carries for a six-yards-per-carry average, and shifty redshirt freshman Ramon Jefferson will be the ball carriers. “Joe is Mr. Reliable in everything he does and Ramon is our big hitter. He can break one at any time. He’s explosive,” Harasymiak said. The offensive line graduated three four-year starters in tackles Jamil Demby, who was drafted by the Los Angeles Rams, Isaiah Brooks and guard John Reddington and has just two starters back in sophomore center Chris Mulvey and senior tackle Cody Levy. Transfer Migel Garcia and sophomore Liam Dobson will be the starting guards, and sophomore Gunnar Docos will be the other starting tackle. All are at least 300 pounds, except the 290-pound Garcia. Freshmen tackle Kevin Jones and center Michael Gerace, sophomore guards Robert Smoloski and Tyler Royal, and junior tackle Corey Moore will also see playing time. “We feel good about them. They’ve been going up against a quality defensive line in practice. We’ve got some good weight on them, which is good,” Harasymiak said. UMaine’s offense will have to improve its third-down efficiency which was next-to-last in the CAA a year ago at 34 percent. A more experienced Ferguson should help. Three All-CAA picks headline a potentially stellar defense, which returns its top eight tacklers. It’s defense limited opponents to a 27 percent success rate on third down, best in the CAA. Senior linebacker Sterling Sheffield (64 tackles, 12 tackles-for-loss, 5.5 sacks) and junior cornerback Manny Patterson (17 pass break-ups) were second-team picks and junior defensive end Kayon Whitaker (65 tackles, 14 TFL, 8.5 sacks) was a third-teamer. Sophomore LB Jaron Grayer led the team in tackles (79) and junior nose tackle Charles Mitchell was in on 58 tackles including 11.5 for loss and 4.5 sacks. Linebackers Deshawn Stevens (50 tackles) and Taji Lowe (38) and safeties Darrius Hart (42) and Jeffrey DeVaughan (29) are also back. Hart and DeVaughan are seniors, Lowe is a junior and Stevens is a sophomore. Junior tackle Alejandro Oregon had three sacks among 22 tackles. Redshirt freshmen Jamehl Wiley and Shaquille St. Lot have cracked the lineup at tackle and cornerback, respectively. Erick Robertson saw some playing time in the secondary as a freshman last year and sophomore Jordan Swann will also get playing time there. Connor Walsh is a senior end who appeared in nine games. The Black Bear defense was victimized by the big play and its season ended on a 35-yard Hail Mary pass that gave Stony Brook a 20-19 win. That was one of seven TDs of at least 33 yards it allowed. That has been addressed by Harasymiak and his staff along with their fourth-quarter collapses. Special teams should also be a strength with dynamic All-CAA first team kick returner Edwards (24.5 yards per kickoff return) and 2016 All-CAA second team punt returner Wright on the field. Senior Mozai Nelson (16 tackles in 8 games) was an All-CAA first team special teams selection and the Black Bears will need sophomore kicker Kenny Doak, who lost his starting job to the now-departed Brandon Briggs, to become a reliable performer. Freshman David Gelb will be the punter with junior Derek Deoul also a possibility. UMaine has to exhibit better discipline as it was the most penalized team in the CAA (86.4 yards per game). 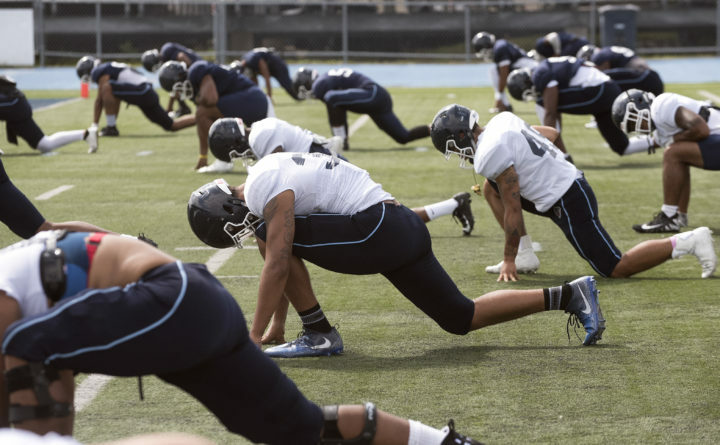 The Black Bears will have the added motivation of playing for defensive back Darius Minor, who collapsed and died of a heart condition during training camp. The league schedule is also favorable with just one game against a team picked to finish in the top four in the league in the preseason coaches poll: No. 2 UNH.